Over the years I have assembled a small motley collection of networking kit however nothing quite fitted the bill for what I need for my new lab. I have managed kit, but only 100BaseT and I have Gigabit kit, but only unmanaged. What I needed was something with a good amount of ports, managed, Gigabit and with PoE because I can, and it’s useful for stuff later on. I also needed the 5000 bucks to buy one. Not wanting to blow the entire budget on a single bit of kit it was off to eBay to find something ex-corporate. Now I could have grabbed whatever Cisco unit ebay had to offer, but again they’re not exactly cheap. Nortel went bust some years ago, and the company was sold off in various chunks, but they used to make some solid networking kit. As they’re no longer about, and they’re much less desirable than the big Cisco their switches are a lot cheaper second hand than almost everything else. In fact, after looking around a bit I picked up a Baystack 5520-48T-PWR, which gives me 48 ports of lovely PoE Gigabit managed networking, delivered from a seller the other side of the States for under 250 dollars. Nice! That’s right, the logo on the outside doesn’t match the inside. Of course, as with any bargain there is a catch. In this case though it’s not exactly a deal breaker. The switch is a full layer 3 switch for IPv4, but doesn’t contain the hardware to do IPv6 routing so it’ll only do layer 2 for IPv6. This isn’t a massive deal unless you’re running multiple IPv6 VLANs and you can always add a separate router to add IPv6 to your network later, in fact a quick glance at eBay suggests you can get something pretty heavy-duty from your favorite network kit provider for under 200 bucks. 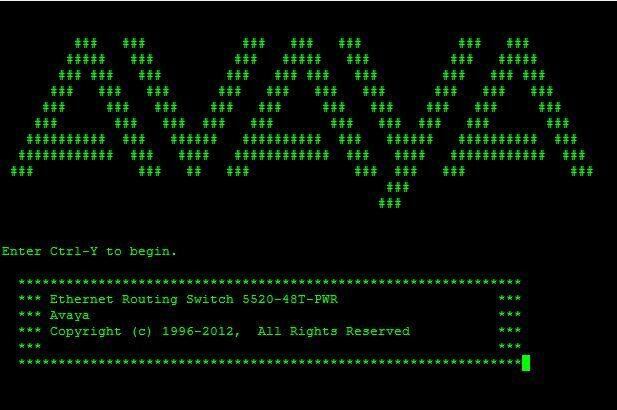 As people I worked with might tell you I’m not the world’s biggest Avaya fan, having had to work with an old IPOffice system, and their support can be pretty ropey at times, but I’m not doing anything particularly taxing or out of the ordinary so we’ll see how it goes. It’s now sitting on my desk humming away and routing IPv4 VLANs quite happily, it does indeed do PoE and it’s not too horrendous to configure. In fact, I’ve pretty much only needed to glance at Michael McNamara’s excellent blog to get 90% of the configuration done I needed (In fact, if you Google 5520 and what you need, the first link is nearly always his site anyway). Now I just need to finish off the LackRack and get it mounted. While setting up the first server of my lab I thought I would add a small aside here on Canonical Name records (CNAME) with DNS. A lot of the DNS documentation out there explains what a CNAME is, but not always why you’d want to use it. To begin with lets look at the difference between a standard A record and a CNAME, I’m using the ever-present contoso.com as the domain, in the style of Microsoft. It’s a good idea when setting up any service to create a CNAME for that service, in the above example a web server (in fact, you’ll definitely want to do this for multiple web sites on the same box). This allows you to move that service to another server later on without needing to do any more than change where the CNAME points. For example, I’ve just set up a NTP time server on my Ovirt Engine server (Spoilers!) however I may in the future find that the box isn’t capable of controlling my virtual server host nodes. If I had used the A record directly, I would have to go into each node and change the server address, or rename the old server and give the name to the new but then what about my time service? Both is much more work than a quick re-point. This also means I can run them concurrently, and roll-back is as easy as reverting the CNAME change. And there is one, not a big one, but it can cause and issue. Each DNS record has a Time To Live or TTL which tells a machine how long it should cache the record for in secords before it checks again with the server. This is normally a good thing, it means less load on your DNS servers and less DNS traffic, however if I adjust my CNAME as above and the TTL is set for say 1800 seconds it can take a machine 30 minutes to see the change. The easy way around this is to remember to reduce the TTL before you make the change to a nice low number, remembering you’ll need to wait at least the old TTL for that to take effect. Don’t forget to reset it afterwards! Before I get stuck into racking everything into my LackRack I decided I needed somewhere I can work on the kit, which means I first had to find a desk. 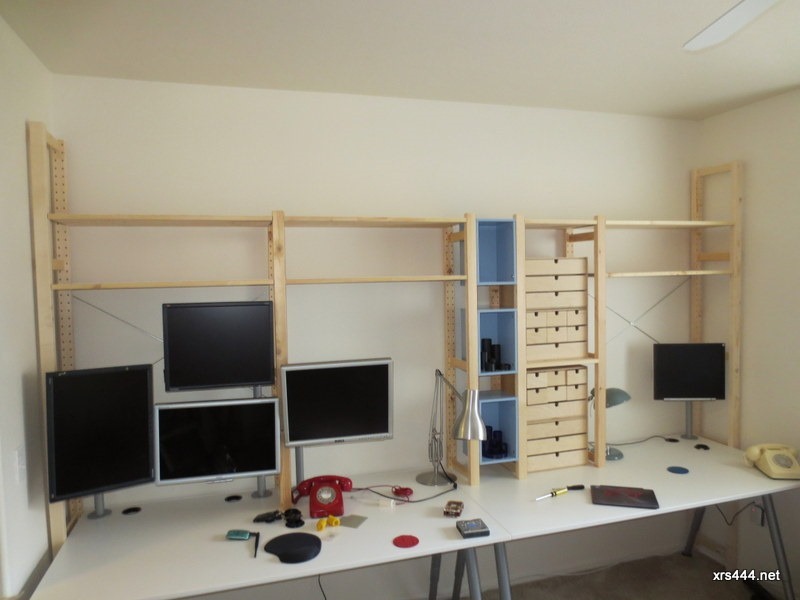 My monitors are mounted on bolt-through poles, and I didn’t fancy sitting on the floor with them propped up around me! I’ve been building desks with my Father for many years, usually using cheap legs from Ikea with an edge-lipped MDF top, however I’m now 6000 miles and half the voltage from his power tools and assistance (not to mention his outstanding AutoCAD skills), so I wanted something I could bolt together quickly and wouldn’t need to put a finish on. Having moved from the UK with all the associated expense, I needed it to be reasonably cheap and not need much in the way of tools. 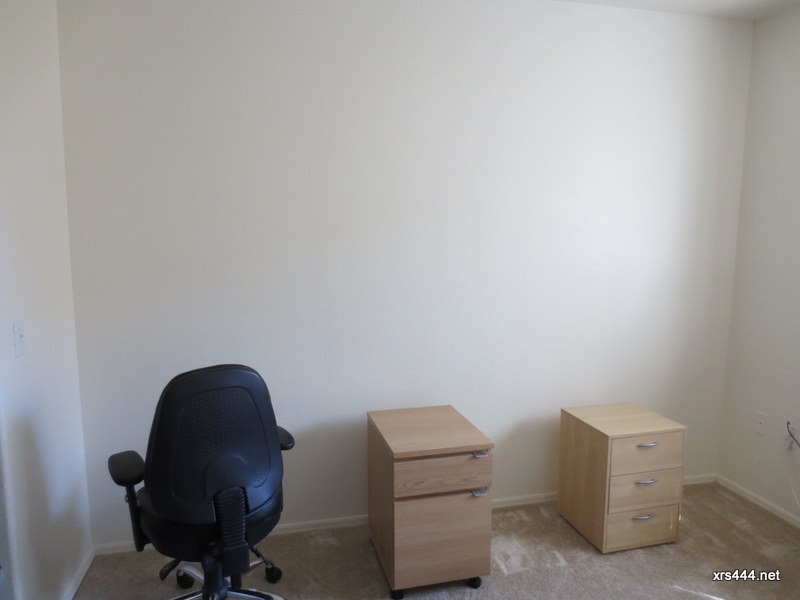 I have a nice alcove in the spare room that is pretty much the depth of a full size desk (800mm) and rather handily just over the width of two full size desks (1600mm a piece) so it was off to (where else!) Ikea for some of their Galant desks to fill the space. These are their standard office desks and for the 150 dollars ish you can’t really complain. I’ve outfitted an office with these before and they held up about as well as the 600 quid desks they were next to. Fueled by tasty meatballs I soon had two white (cheapest!) desks nestled in there. 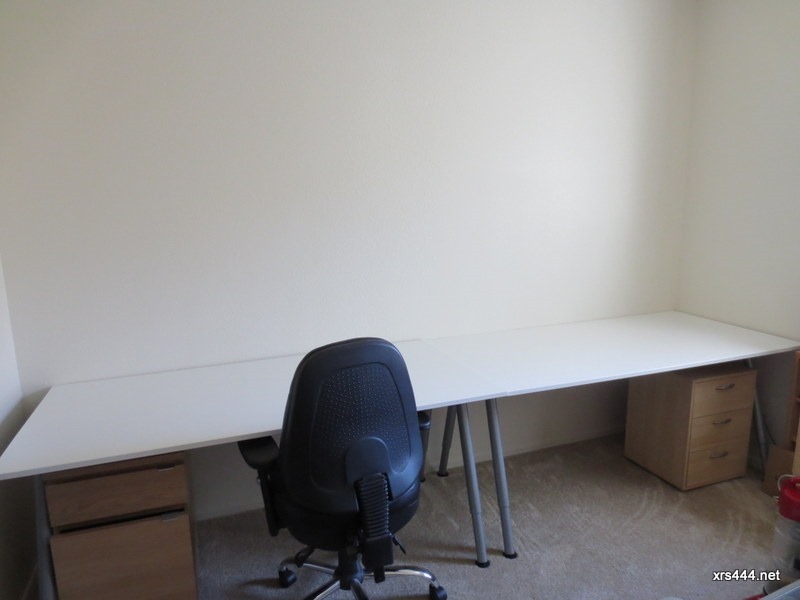 To stop them shifting about and leaving an unsightly gap I also picked up one of their cheapest end table frames and poached the connecting bars which allowed me to bolt the desks together. It’s a shame they don’t do those separately, but at 20 dollars it was hardly bank breaking! 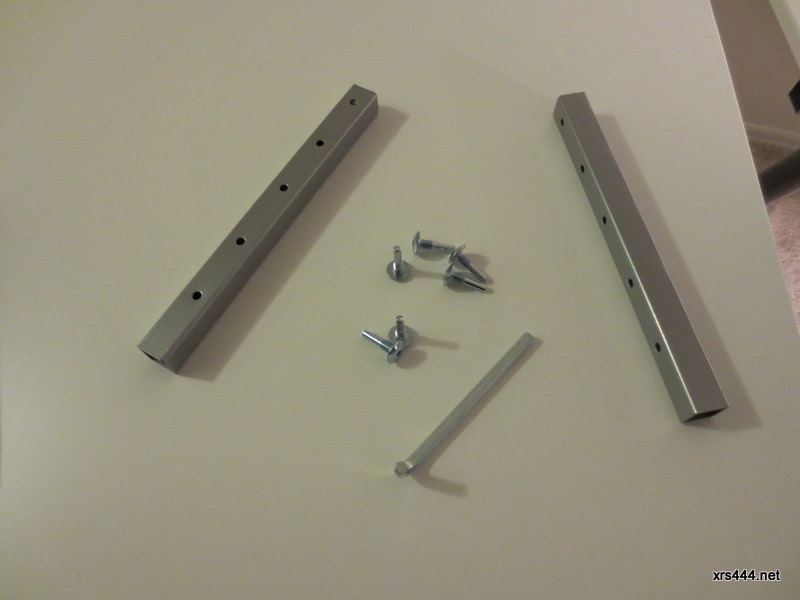 These are the bits you need from a frame, I used part number 900.568.89 which seemed to be the cheapest way to get them. Exciting indeed, but if that was it you’d be wondering why I bothered to write this. Of course this is where the fun began. 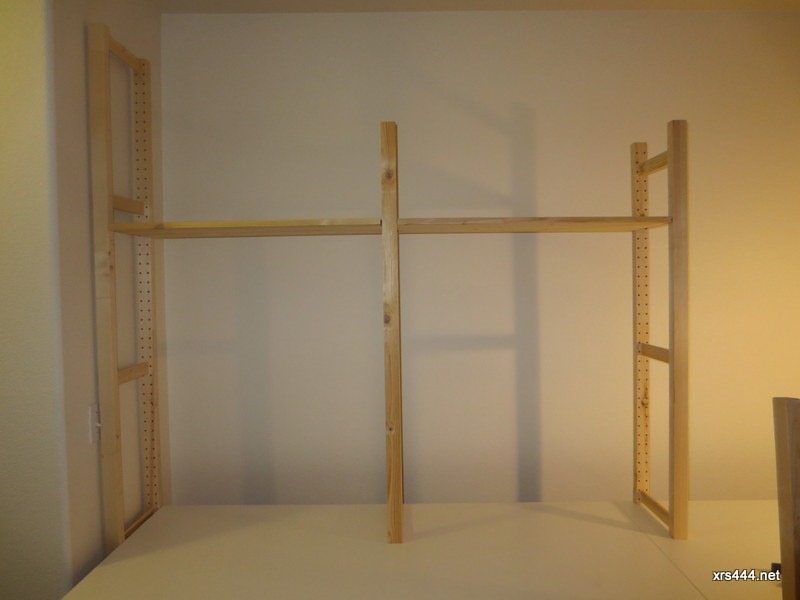 There is just enough space to squeeze an Ikea Ivar upright at each end. (Excuse the lighting, for some reason this room doesn’t have a central light fitting and we’ve not found a suitable table lamp yet). I’ve done this before, but that time we screwed through the underside of the desk to bold the Ivar uprights down. 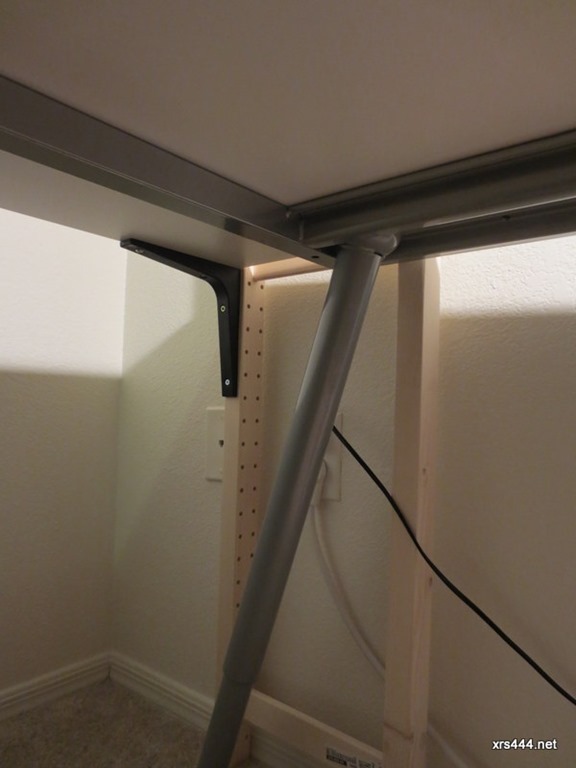 This time they are freestanding as I added a bracket under the back edge of the desk to the tall uprights to stop them falling forward if they were pulled. Don’t forget to add cross bracing to at least one pair of uprights, I have one set each end on pairs with the longest shelves. 50c in Ikea well spent! Of course nothing in life is ever easy, and we faced one critical issue. There is no combination of Ivar units that is the same as the length as my two desks, so we were going to need a fill in. I could have just made up some shelves the right length, but fortuitously we spotted these MDF boxes in Ikea which just happened to be the right size, and on sale for about 7 bucks a piece! About the same cost as buying some wood to make the shelves and no need for a saw, sander and so on. A couple of holes in each side (clamp a piece of wood under where you’re drilling to help protect the finish when the drill comes out the other side) and then we can get them fitted. I started with the top box clamped to a piece of wood running across the top shelf to make it line through, then worked my way down. 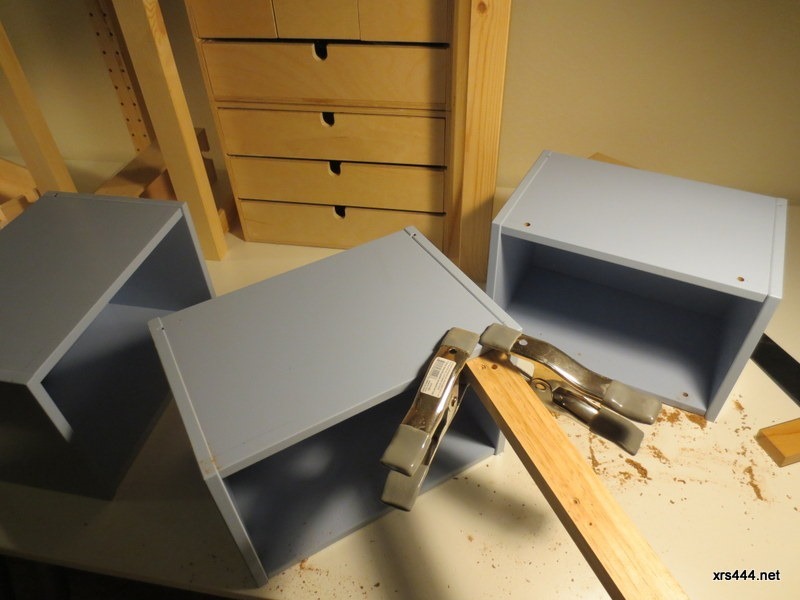 One of the wooden drawers from these old Ikea drawer units was a good size, so I pressed them into use as spacers. I marked out the holes for each box, drilled a pilot hole then bolted them to one side of the uprights. 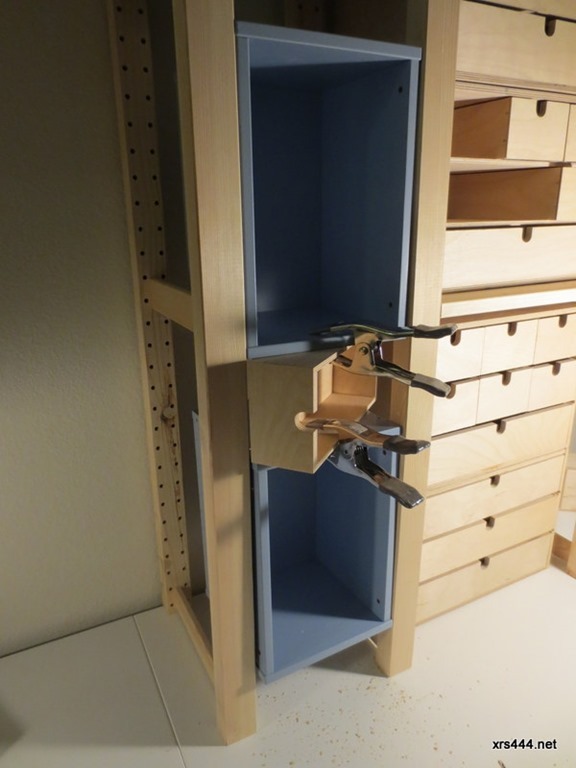 This allowed me to pull one side of the shelves forward so I could get the drill in to make the holes as I went down. To neaten up the gap between the box and the uprights so you couldn’t see the bolt, I slipped an O-ring in the gap. 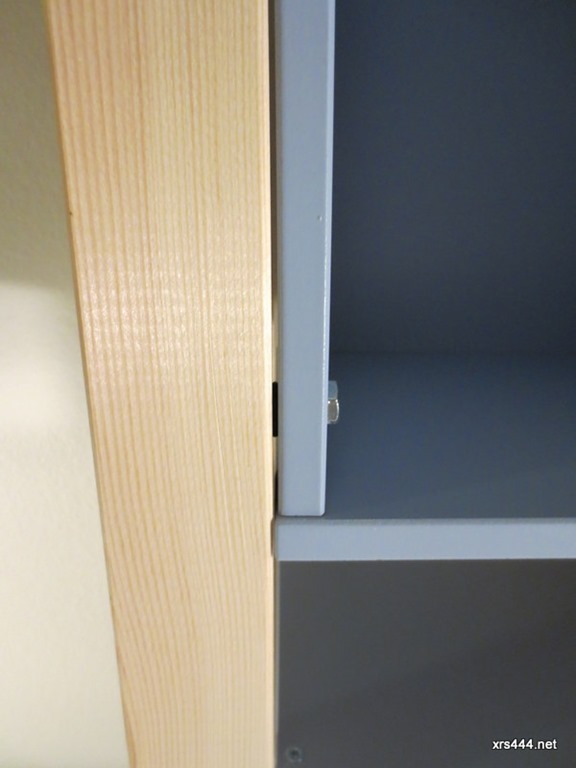 I used lag bolts for two reasons, firstly they only had countersunk screws in Home Depot and I didn’t want to countersink the holes, the other was it meant I could do them up quickly with a ratchet rather than awkwardly with a screwdriver! 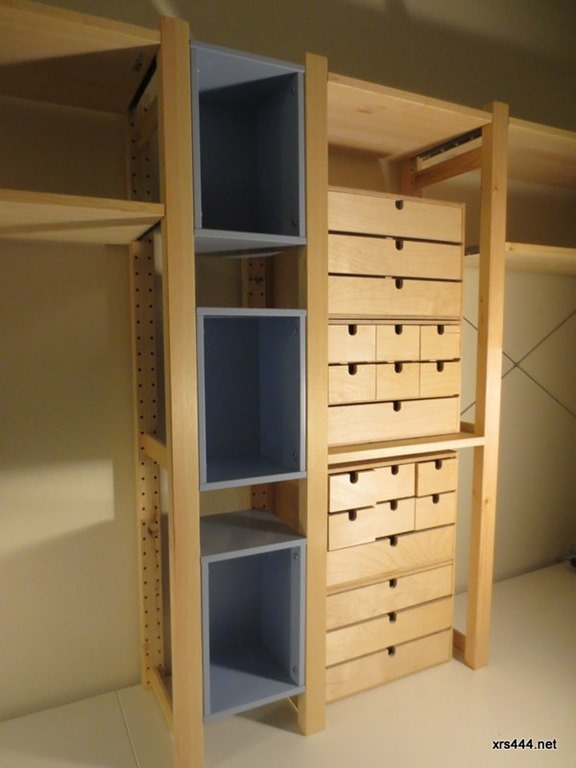 The gaps between the boxes form little shelves, so there’s a decent amount of space there. 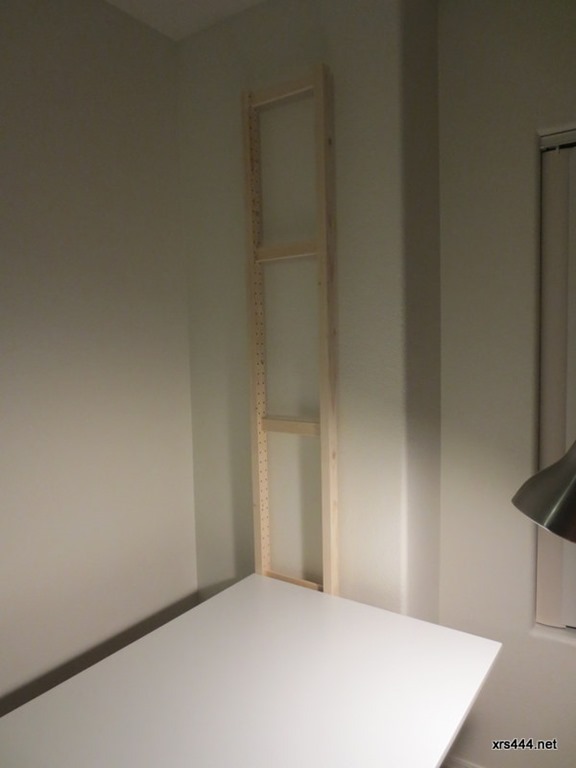 I was going to put a plywood plate across the gap at the back, but it seems solid enough not to need it. The shelves finished it was time to look at the cable management. 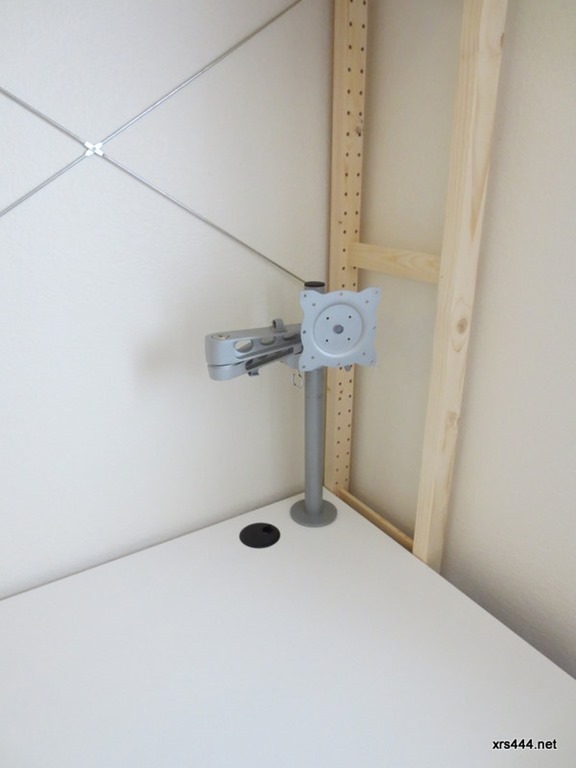 First I drilled out holes for the monitor poles and some cable access grommets, one for each pole. If you are going to do this, take my advice and run a small pilot hole first, then drill up from the bottom through the finish, then down from the top. If you don’t the veneer on the desk is quite prone to cracking and the drill can tear it up on the way out! I’d use a bi-metal hole saw if you can for the grommets. Either way take it slow and watch the bits don’t get too hot, they’ll blunt quickly and it’s surprising how quickly they do going through the desk. Under the desk I added two Galant cable trays and some power bars from Fry’s Electronics for power, each one plugged into a single socket surge protector They are just zip tied around the frame, I could have done something more permanent but there’s not a lot of point. I fitted the baskets back to front as it made cabling through the holes easier. You can slide two of the tabs that hold them on between the table frame and top to make life easier. 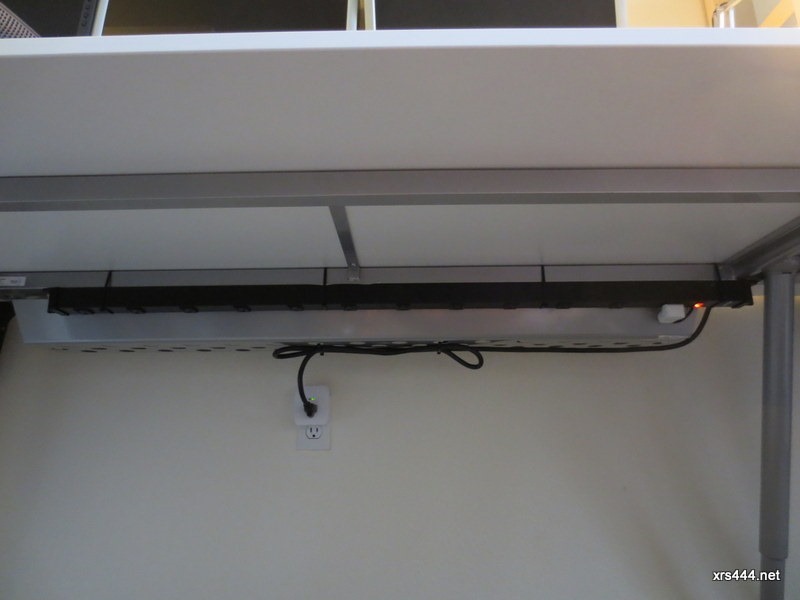 Under my last desk I had three sectional trunking with phone, network and power. By wiring switches on the top of the desk I could turn off everything but the PCs themselves when you left the desk to save power. Sadly cost constraints stopped me from doing this right now, but it wouldn’t be hard to add it later. Besides, wiring up that many 13A sockets in a ring configuration under a desk was not exactly a job I’d choose to do again although the result was very nice. I always try and keep the cables up out the way and not trailing on the ground, this not only looks neat and tidy it makes vacuuming a lot easier as you don’t have to move a mat of cables out the way and they’re less likely to get damaged. I use four monitors and they are a rather motley assortment as I have gained them over the years. With an SLI rig I can either use all four when I’m working on something, or one at full pelt for games. It really does come in handy when you have a web page open, a couple of remote sessions and some monitoring stuff up to see it all at once. Ideal for setting up and using a lab. At the other end is my wife’s monitor, she uses it with her laptop via a Toshiba Dynadock and is happy as it is, apart from when I cover the desk in my stuff. Once I’ve got the monitor heights fixed I might add another shelf above the two single monitors, but for now, I just have to finish up and put all the stuff in boxes on the floor on the desk! It took about a weekend from a Friday night plan to this state, including buying the stuff, grocery shopping and various other errands. If you didn’t want a lie in you could knock it out in a day.